The Greeks listed the Great Pyramid of Giza as the first wonder of the world and it is the only one of the seven still remaining to this day. Any textbook on Egyptology will tell you that the pyramids were built as tombs for rolex replica pharaohs. Why then is there so much interest about the Great Pyramid of Giza? Is there something unique about this pyramid? In the last 100 years, this assumption has been questioned for several reasons. No mummy or remains of any kind have been found in the great pyramid. It does not seem likely that the pyramid had been robbed. When it was first entered by the Arabs in 820 AD, the only thing found in the pyramid was an empty granite box in the King's chamber called the "coffer". (It is possible that there may have been one in the Queen’s chamber also that has been destroyed since then.) Also, contrary to Egyptian practice, the empty lidless box was uninscribed and undecorated, for it would almost certainly have been covered with hieroglyphics and paintings had a pharaoh been placed in it. It is the only pyramid in Egypt that has both descending and ascending inner passages. Every other pyramid known only has descending passages. There must be some unique reason why this ascending passage with its chambers and magnificent grand gallery was built into the pyramid. We know that airshafts were built into the King’s and Queen’s chambers, but what was the purpose of these airshafts? Dead pharaohs do not need air. There is so much detail and information built into the great pyramid that it seems it replica watches uk would have another purpose. When you study this information with an open mind, you realize that maybe this pyramid, the greatest one ever built, was not built as a tomb for a pharaoh, but for some other purpose. The pyramid is oriented true north with a greater accuracy than any known monument, astronomical site, or any other building. In our times, the most accurate north oriented structure is the Paris observatory. It is 6 minutes of a degree off replica watches true north. The Great Pyramid of Giza is only 3 minutes of a degree off true north. Studies have shown that this 3 minutes of a degree off true north is due to either a shift in the in the earth's pole or movement of the African continent. It originally was perfectly oriented to true north. It was originally covered with casing stones (made of highly polished limestone). These casing stones reflected the sun's light and made the pyramid shine like a jewel. They are no longer present being used by Arabs to build mosques after an earthquake in the 14th century loosened many of them. It has been calculated that the original pyramid with its casing stones would act like gigantic mirrors and reflect light so powerful that it would be visible from the moon as a shining star on earth. 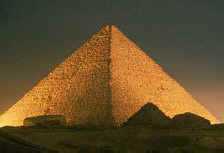 Appropriately, the ancient Egyptians called the Great Pyramid "Ikhet", meaning the "Glorious Light". 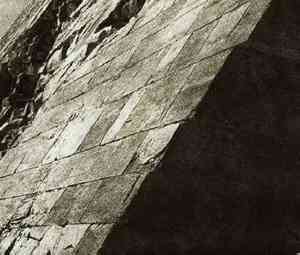 How these blocks were transported and assembled into the pyramid is still a mystery. Many theories have been proposed, but none of them are really feasible. The pyramid of Dashur showing casing stones.